It was the first round of the playoffs, the Bulls on the road and with a chance to get on an underdog run in the playoffs despite losing the opening game. It seems if they just had that one more guy who was sitting there on the team bench, looking pretty good, but still not playing. If only get could get in there. Why wasn’t he? Deng, as we know, has gone on to become a two-time NBA All-Star selected by the Eastern Conference coaches, arguably the team’s MVP and one of the NBA’s ironman in leading the league in minutes played for most of the last three years. He plays now without mention of a left wrist injury so severe surgery was contemplated last summer. Many said he should skip the Olympics. Now he plays and there never is a mention. Yet, just a few years ago, Deng was missing late season and playoff games amidst questions about why he wasn’t playing. There were indications he could or should at least try. But he knew his body wasn’t right. He stayed out after the lowest scoring season since his rookie year. But he returned to become the rock of the Bulls rotation. So he winces as he hears grumbles from outside about his teammate Derrick Rose, that Rose should be playing after major reconstructive knee surgery less than a year ago, that Rose is letting the team down, that he can play. Perhaps no one understands like Deng, who was there, and it left a mark. It’s not like Deng doesn’t understand the fans desire what’s best for the team, as he does. He loves the support he and the Bulls have received. But Deng also understands it’s your life and your livelihood, and how difficult it is to insist you care when everyone believes you don’t. It’s why Rose has long had the support of his teammates and the staff. Not that it’s a separate world that no one else can understand, but it also helps to be there. Which Bulls coach Tom Thibodeau addressed again Sunday after a Bulls team meeting when asked about adverse public reaction to Rose not playing. “It’s not bothersome because I know all he’s putting into it,” said Thibodeau. “I know who he is. I know his character. And he’s done amazing things for our organization. He’s doing all he can. That’s all you can ever ask a guy to do. There’s always going to be some negativity. I think the vast majority is very positive. Which is the part that has most frustrated Deng and teammates. They all on various levels have gone through somewhat similar situations. And there’s nothing worse than your character and competitiveness being questioned when there is nothing you can do. “It will make you a better player,” said Deng, “but you will never forget. I became a two-time All Star. But I will never forget how I was treated. It’s something you put behind you. But you don’t forget it. “I think Derrick is doing the right thing,” said Deng. “A lot of times people don’t really think about how he feels. Because the guys is getting paid doesn’t mean it’s the smart decision to just come back. And Deng knows this Bulls team and season isn’t built for just now. He knows Rose will return and the belief is the group can be championship material, as they were convinced they were last season before Rose’s injury. So it’s a bit of a detour, even if they are hardly giving up on this season even after Saturday’s disappointing 106-89 loss to the Brooklyn Nets in Game 1 of the playoffs. The Bulls are in Brooklyn for Game 2 Monday, and Deng believes and is confident it will be a different Bulls team than the one that gave up 56 inside points, 40 in the first half when they trailed by 25 points at halftime. Though the biggest one is the effort, the rebounding, the physical play the Bulls have prided themselves on. The intangible desire that has become routine for them was curiously absent. That, Deng and the other players who met with reporters Sunday, insisted will change. It’s not unusual after a first playoff game like that. Not to make excuses, but Joakim Noah was a surprise starter, though he played only about six minutes in each half. That changed the rotation again as Nazr Mohammed played just six minutes. Thibodeau said Sunday Noah’s foot problem was improved and he would start assuming there were no setbacks and presumably play more. Though there were some saying to go more with Mohammed to provide a bigger look against Brook Lopez, whose fast starts have hurt the Bulls in recent games with the Nets. Though Jimmy Butler got the start for defensive purposes against Joe Johnson and had 13 points, there was some thought about having the versatile and more athletic Butler come off the bench because Butler can be a reluctant outside shooter. Thibodeau clearly was searching for perimeter scoring after a slow start as Butler, Deng and Kirk Hinrich all were missing shots. He went with Nate Robinson, which reduced the ball movement, and a smaller front line with Carlos Boozer at center and Deng at power forward, and the Nets took advantage and ran away with the game. Thibodeau indicated it was possible Richard Hamilton or Marco Belinelli could return to the starting lineup for an offensive boost to also spread the court, though, of course, Thibodeau left any potential changes uncertain. 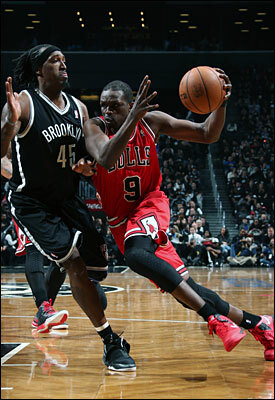 “This has been our team all year,” Deng said about the injuries and disruptions and changing rotations. “We’ve done well with guys out, guys in. We’ve been able to deal with that. It’s us against them. “I’ve had bad games before,” he said. “It’s nothing new. It happens. You never go out and try to have a bad game on purpose. I thought the game got out of hand early. We should have stayed aggressive. We tried to play our way back in, but it’s one game. They won the first game at home. It doesn’t really matter how they won. It’s the corrections we make. We know we can be a lot better and we will be. In other words, the Nets have gotten their attention. Fortunately for the Bulls, just on the road in Game 1. Though Deng did bristle a little when asked a bit unthinkingly whether it was Noah playing through his plantar fasciitis who was the real competitor. Deng said rebounding will be vital, swarming the boards against the Nets as they’ve done so much this season. Though that routine has suffered a bit late in the season with Noah and Taj Gibson out. Because they’re all men who are great competitors. As anyone who has watched them these last several years should know.